This is a little pudding shaped piece of dessert heaven straight from our chalet kitchens. 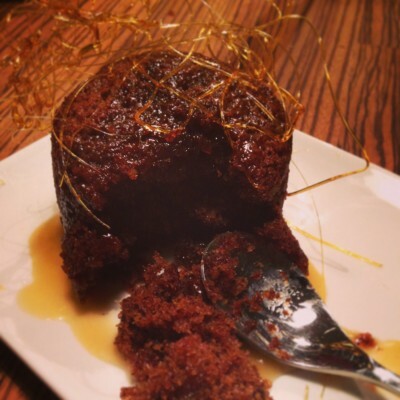 A light, fluffy, moist pudding with a completely over indulgent salted caramel sauce with a delicate crunch from the spun sugar. Soak the pitted and chopped dates in brewed tea for 2hrs min. Cream together the butter and sugar then add the golden syrup and eggs and whisk. Butter the inside of the chef rings and line with greaseproof paper. Combine, sugar, cream, butter and salt in a pan over a low heat. Stir until the sugar has dissolved. Increase the heat and bubble for 3-4mins until golden and syrupy. The longer you bubble the sauce the thicker it will become. Leave to cool for 10mins before serving. Add a tiny amount of water to the caster sugar and bring to boil over a medium/high heat. Do not stir and allow to turn to a caramel colour, you can check with the thermometer it should reach around 160-170°C. Prep a heat proof surface with baking parchment. Dip the fork into the caramel and allow caramel to fall forming a continuous ‘thin string’. Move the fork over the paper and gently flick the fork to create nests of spun sugar. THE SUGAR IS EXTREMELY HOT AND STICKY.